Twitter is getting into e-commerce. It’s now possible to buy goods online in two steps by tweeting a special hashtag. 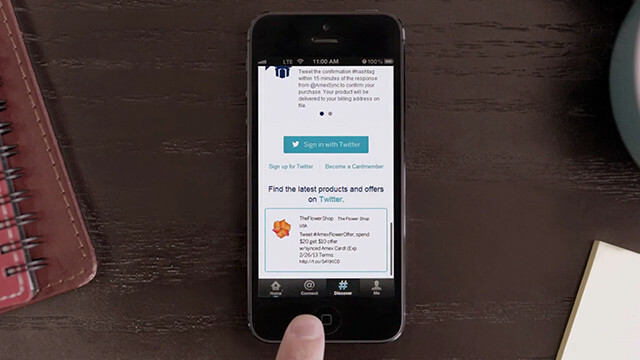 The new collaboration between Twitter and American Express will turn the social media service into a shopping cart. American Express members who sign up will be able to buy products by mentioning the appropriate hashtag in a Tweet. The @AmexSync account will tweet back with a confirmation hashtag. Once you tweet that confirmation hashtag, American Express will shoot you a confirmation e-mail and give you 15 minutes to confirm you want the product. Your card will be charged and the goods shipped to your billing address. The two companies announced the partnership on Monday and kicked it off with a single product offering, a $25 American Express gift card for $15. Other products will be available starting Wednesday morning. To start Twitter shopping you’ll need to first sync your American Express card with Twitter. The service will only work with compatible American Express cards (no prepaid or corporate cards) and a public Twitter account. Since protected accounts aren’t allowed, there’s no way to take advantage of a discount without it being public information. That means each purchase is not only money for the various companies involved, but also an automatic promotion for the product and its brands. The first discounted products American Express will sell are an Amazon Kindle Fire, a Sony Action cam, a Donna Karan designed bracelet and an Xbox 360. Though various companies will tweet out the hashtags, all official product offers will be collected under the American Express Favorites section. This is not the first time American Express has experimented with social media. Its Amex Sync program, launched last March, offers discounts on Twitter, Foursquare, Facebook and Xbox Live. On Twitter, you tweet the hashtag for an offer and then go make the purchase in person or through a separate online store. The discount is then applied to your American Express account within eight weeks. Social networks have been working hard to break into e-commerce. Facebook announced Facebook Gifts, which lets users make purchases for friends directly through the social network. Buying products this way is a unique case. Because it’s for select discounted products, many of which will only be available for a set period, tweet-buying is not for people who are searching for a specific product or comparison shopping. It has much more in common with flash sales sites like Fab than e-commerce mainstays like Amazon. By wrapping the entire purchasing process in a hashtag, the service makes buying fast and easy. If it takes off, we could see hashtags for products in commercials and print ads.